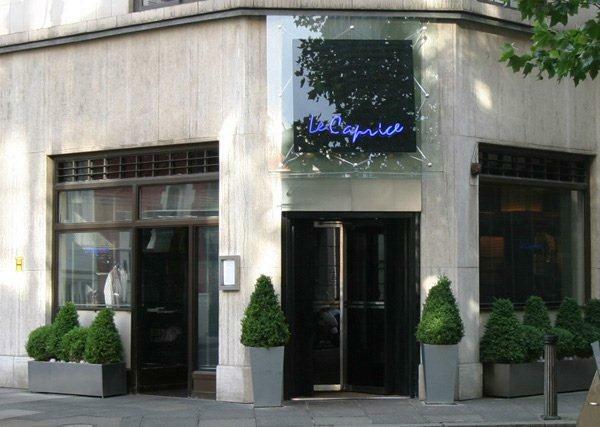 Tomorrow sees Le Caprice mark 30 years as one of the capital’s most enduring after dining hot spots. Made famous as the celebrity and a royal favourite long before being eclipsed on the celebrity circuit by the Ivy came along in the nineties, it is apt that eleven of the biggest names in music have joined together to help in the celebrations of this Mayfair icon. Stars ranging from Sir Paul McCartney, Coldplay and Gary Barlow have nominated their favourite songs for a limited-edition book of piano sheet music to be played on the restaurant’s piano. According to Jesus Adorno, Le Caprice’s Bolivian born maitre’d and now also its director, the piano is one of the touches that make Le Caprice different. The restaurant’s Yamaha is wheeled out for dinner replacing one of the 20 tables in the intimate dining room. 200 copies of the book are being printed, with a foreword by Jools Holland and proceeds will go to War Child, the charity that helps young people who grow up in conflict zones. The restaurant also celebrates its reopening after a £500,000 interior facelift to brighten up the art deco interior with original David Bailey portraits. The restaurant is now owned by Richard Caring, the billionaire owner of Wentworth, The Ivy, Soho House and Annabel’s to name a few of perhaps one of the most prestigious restaurant and club portfolio’s in the world. He had jokingly said he purchased Le Caprice group as it was costing him too much to dine there every night. Le Caprice will be forever linked with Princess Diana and Princess Margaret who were loyal customers. Mr Adorno has poignant memories of Princess Diana as a most charming lady but said, “There was only one downside, when Diana was in nobody would want to leave they all wanted to wait until she had left, and then there would be a massive exodus.” On the evening after she died her table, table nine, was kept empty, with a single candle burning as a tribute.